You don’t have to be stuck to your desk in order to run your business. 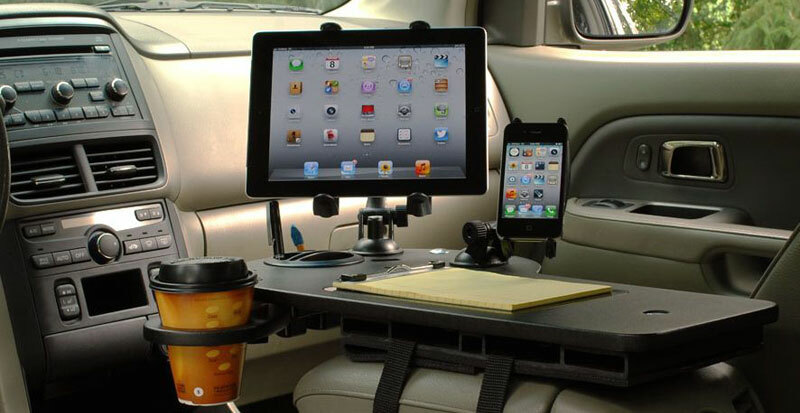 You can create an effective mobile office so you can travel wherever you’d like. With a few foundation items, you can network with others, make deals, and monitor the pulse of your company. It can be done all from the comfort of a car, train, or plane. Will you need to sign documents? Meet with clients or employees? If you’re only checking emails or taking phone calls, your cell phone may be the simplest equipment. But if you need longer online time or stronger computing abilities, you’ll need a laptop, netbook, or tablet. You can find heavy duty computing power with laptops at Office Depot. If you like the convenience of having a tablet too, consider one that transforms from laptop to tablet, such as the HP Pavillion. If that’s too big, try the Galaxy Note, a tablet that offers business functions, such as a full onscreen keyboard and office applications for documents, spreadsheets, and meetings. If you handle actual paper documents, consider investing in a portable scanner and wireless printer. You can find several brands at Sam’s Club. With a portable scanner, you can keep track of documents or receipts by scanning them to your computer or cloud storage system. If you need a paper backup, you can download and print documents with a wireless printer. The last but not least important equipment includes a sturdy laptop case, wireless mouse, extra batteries, a surge protector, extra charging cables and flash drives or USB drives. These accessories will protect your equipment on-the-go while keeping your virtual business running reliably and consistently.